The Mercedes-Benz G63 AMG 6X6 can’t be described with just one word. It warrants words like extreme, ultimate, beast, massive, and monster. And that is exactly what the incredible machine is; It's an MUV (Monster Utility Vehicle). There has never been a category for a vehicle like this before now. But leave it up to Mercedes-Benz to come up with a new vehicle segment that blows away everything else on the planet. And it will be massively expensive when it hits showrooms late this year. According to AutoCar, the huge G63 AMG 6X6 will have a sticker price of 350,000 euros ($457,000) making it the second most expensive vehicle Mercedes offers behind the new SLS Electric Drive. The new G63 AMG 6X6 is a six-wheel off-road beast that will go anywhere its owner desires to take it. So why would Mercedes produce such a monster? They only plan on producing a limited number (around 20-30 examples) when it rolls out later this year. Of course only the ultra-rich will be able to afford the price of the huge six-wheel double-cab pickup. It is set to be produced by Mercedes-Benz's Austrian partner Magna Steyr and is an even more rugged version of the G320 CDI conceived and engineered for the Australian army and in operation since 2011. 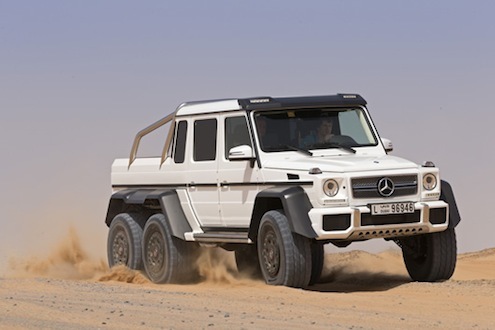 The incredible hulk of a vehicle will ultimately be purchased by wealthy individuals who are preparing for the apocalypse, or rich sheiks in the middle east who want a fun toy to play in the Dubai desert. The plush, leather-lined off-road vehicle will keep its occupants both comfortable and safe from the outside world if it's coming to an end. We can just imagine some of Mercedes-Benz's most affluent clientele taking the new G63 AMG 6X6 to another level and it being tricked out with bullet proof glass and steel plated armor for added security. The G63 AMG 6x6 is about power to go anywhere on the planet. It gets an AMG twin-turbocharged 5.5-liter V8 with 544 horsepower and 560 lb. ft of rock -climbing torque. In the video below, the 6X6 is shown pulling its way up a rock face that would leave everyone else behind. Even with its massive 8,322 pound curb weight, it doesn’t seem to have a problem motivating anywhere the driver points it. The AMG V8 is mated to a Mercedes 7G-tronic seven-speed automatic transmission. The transfer case has an ultra-low range for off-road and a high-range for on-road cruising. Need to prepare for doomsday? There are five electronic differential locks offering 100 per cent lock up of the six massive 37-inch wheels, and can be operated by three switches on the dashboard. The gigantic 12.5in-wide wheels feature a bead-plate design and are wrapped in massive off-road tires. And it can pull up to 1,433 pounds if the owner needs to haul a small artillery gun. So if you have the extra cash and are preparing for doomsday or maybe you want the ultimate hunting rig, the new Mercedes-Benz G63 AMG 6X6 will be available in global showrooms in October. Watch the Mercedes-Benz G63 AMG 6X6 take on a gigantic rock face and win. The ghosts of the Afrika Korps are ecstatic! A new ride for Rommel!